Among the liturgical treasures of Holy Week targeted by the reformers was the ancient service of Tenebrae (a Latin word meaning darkness) – so called because of its gradual extinguishing of lights – which had a continuous history of use in the Church since at least the 7th century until 1955. Yet many Catholics today have not the slightest notion that such a service ever existed in the Church, let alone what it entailed or what it was meant to signify, so great were the progressivists’ efforts to keep them, in quite another sense, in the dark. 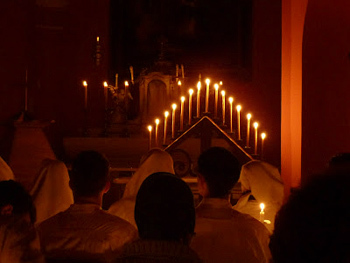 Tenebrae consisted of two components of the Divine Office, Matins and Lauds, which originated from the monastic liturgy and were chanted by the monks after midnight and before dawn respectively. 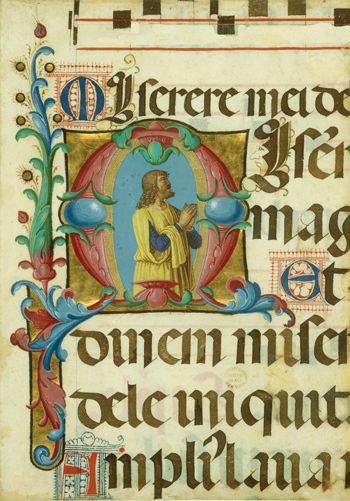 But from the early Middles Ages, the Church, wishing to make these “hours” available during Holy Week at a more convenient time for the faithful, joined them into one single service to be performed on the Wednesday, Thursday and Friday evenings, thus anticipating Matins and Lauds of Holy Thursday, Good Friday and Holy Saturday. The traditional service was characterized by a number of special features, which gave it a striking figurative power, making it an unforgettable experience for the faithful. This was achieved by a unique interplay between light and darkness, sacred texts and chant that moved those present to the very depths of their soul. And it was rich in scriptural passages bearing theological, mystical and allegorical meanings that had been specially chosen to arouse feelings of grief and compassion for the sufferings of Our Lord and, consequently, of sorrow and detestation of sin, which was their cause. The whole service was conducted in an atmosphere of solemn mourning. The Lamentations of Jeremiah were sung in the so-called Planctus (“weeping”) tone specific to certain parts of Holy Week which, however, fell out of favor after 1955. Together with the responsories, antiphons and Psalm 50 (Miserere), they are universally recognized as the most sublime examples of choral music in the Church’s repertoire, made famous by celebrated composers e.g. Palestrina, Allegri, Victoria and Tallis. The ceremony was usually timed to begin in the early evening, when the natural light was fading from the sky and to end in complete darkness. The main source of illumination in the church was candle light, and all eyes were directed to 6 candles on the main altar and 15 on a triangular candlestick called a hearse, (1) symbolizing the Holy Trinity. After each Psalm was chanted (9 for Matins, 5 for Lauds), one of the candles on the hearse was extinguished, leaving the one at the apex (representing Christ) still burning. While the canticle known as the Benedictus was chanted at the end of Lauds, the six candles on the high altar were also extinguished sequentially, alternating from side to side. Near the end of the ceremony, two dramatic events, highly charged with theological significance, were enacted. Second, the sudden irruption of the strepitus (Latin for a loud noise) produced by banging books against the pews, filled the darkness. It was meant to invoke the earthquake that happened after the Crucifixion, the convulsion of nature that accompanied the death of its Author. Lastly, the “Christ candle” was reinstated on the hearse as a sign of the Resurrection, and all departed in silence. It may be difficult to believe, but Psalm 50 – the Miserere – was almost completely eliminated from the Divine Office of the entire Triduum. (2) As a mark of its importance in the spiritual life of the Church, it used to be said both at the beginning and at the end of Lauds, as well as at the end of all the Hours of the Triduum. But, the reform prohibited its recitation at the conclusion of all the Hours of the Triduum, leaving only the one at the beginning of Lauds. Thus, the reform greatly restricted the frequency of the Miserere – the most penitential of all the Psalms. Ironically, in spite of being sabotaged in 1956, Allegri’s Miserere has maintained its appeal outside the Church, not only in Anglican and Lutheran services of Tenebrae, but most especially in the concert hall where it continues to enjoy worldwide acclaim. Its restriction was bound to have profound implications for the Catholic moral life, far beyond the loss of its cultural or musical value. It is not without significance that the Miserere was David’s prayer of repentance and plea for forgiveness after his adultery with Bathsheba. As the liturgy is, in accordance with the adage lex orandi lex credendi, the prophetic witness of the Church’s Faith, it not only speaks – or, in this case, sings – what God has appointed us to believe, but also encourages us to live a life of holiness in obedience to the Divine Commandments. Although the number of candles varied throughout the Middle Ages, the triangular shape of the stand is of ancient origin. It was used during the Tenebrae service as mentioned in an Ordo (book of ceremonials) of the 7th century published by the historian Mabillon, which suggests an even earlier usage. This order was given in Ordo Hebdomadae Sanctae (The New Order of Holy Week) published by the Sacred Congregation of Rites in January 1956. Nicholas Wiseman, Four lectures on the offices and ceremonies of Holy Week, C. Dolman, London, 1839, p. 7. In his General Audience of March 30, 2016, Pope Francis mentioned this Psalm in connection with God’s forgiveness for the sin of adultery. But, departing from the teaching of the Council of Trent, he made no clear reference to the necessary conditions for obtaining Divine mercy – repentance and a firm purpose of amendment. He said nothing whatsoever about the necessity of penance or reparation.